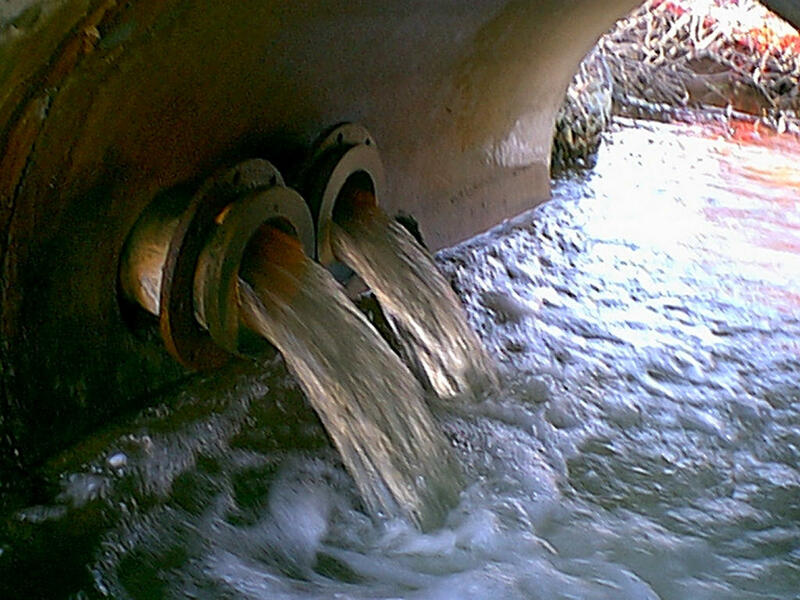 Discharge of treated water into tributary of Honey Creek, 2002. 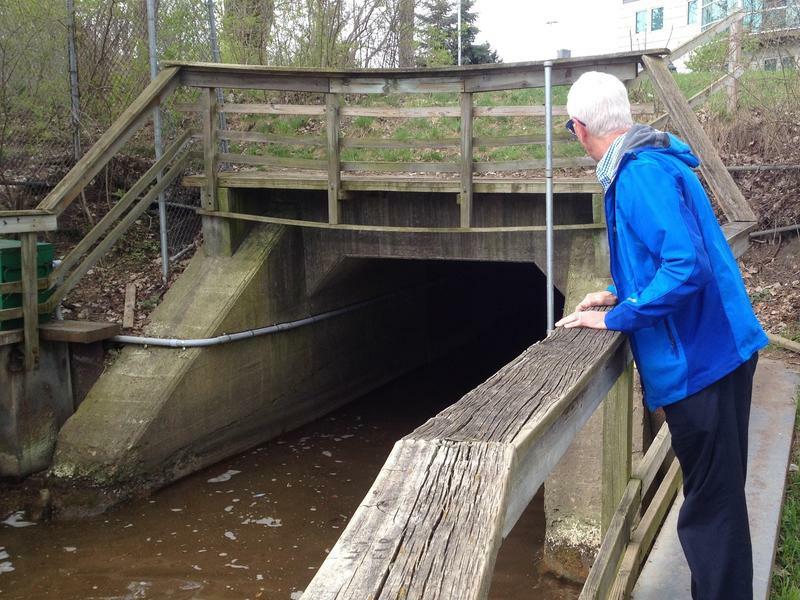 Dr. Larry Lemke at the outflow of Allen’s Creek into the Huron River. 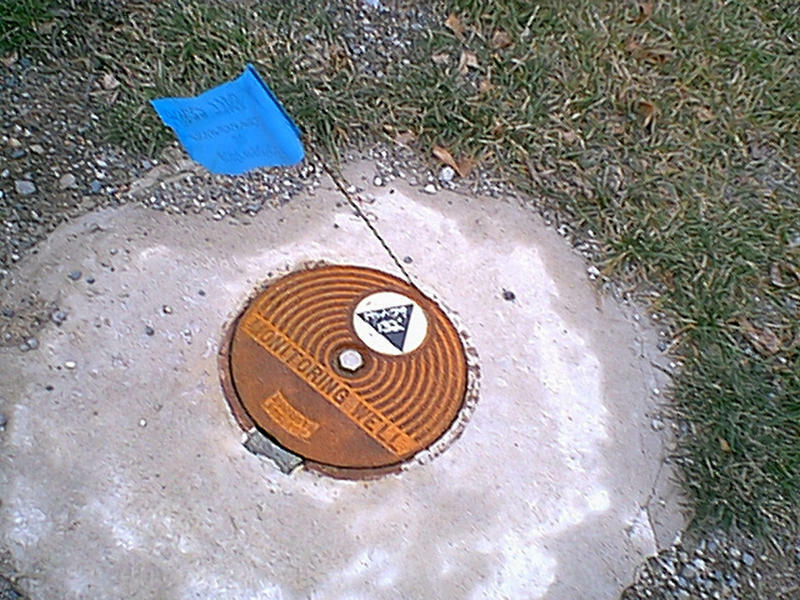 Monitoring well in Vet’s Park, Ann Arbor, 2002. David Fair (DF): The strategy for dealing with groundwater contamination in the Ann Arbor area has been crafted in a series of county court decisions. Washtenaw County and the city of Ann Arbor were not allowed to provide input to the hearings. As part of WEMU’s ongoing series on remediation of Ann Arbor’s 1, 4 dioxane plume, Barbara Lucas explores whether scientific input from the local level will ever become part of the process, and future legal decisions. Barbara Lucas (BL): At the April 18th Town Hall meeting, Ann Arbor Environmental Coordinator Matt Naud announced Attorney General Bill Schuette has agreed to attend local dioxane remediation meetings, where valuable scientific information is shared. Matt Naud: So we really appreciate that the attorney that is going to be representing the DEQ and the citizens of Michigan and Ann Arbor, has the best available science. Because we are fortunately a really well-educated community and we can tap into local residents who just happen to be hydro geologists. And their grad students are building models of the plume. Because the company hasn’t built a model of the plume that they will release to us publicly. BL: He’s referring to research by the director of the Environmental Science Program at Wayne State University. Dr. Larry Lemke: My name is Larry Lemke, I’m a hydrogeologist and a resident of Ann Arbor. I’ve been studying this site for 19 years. Lemke: Do you see it there? 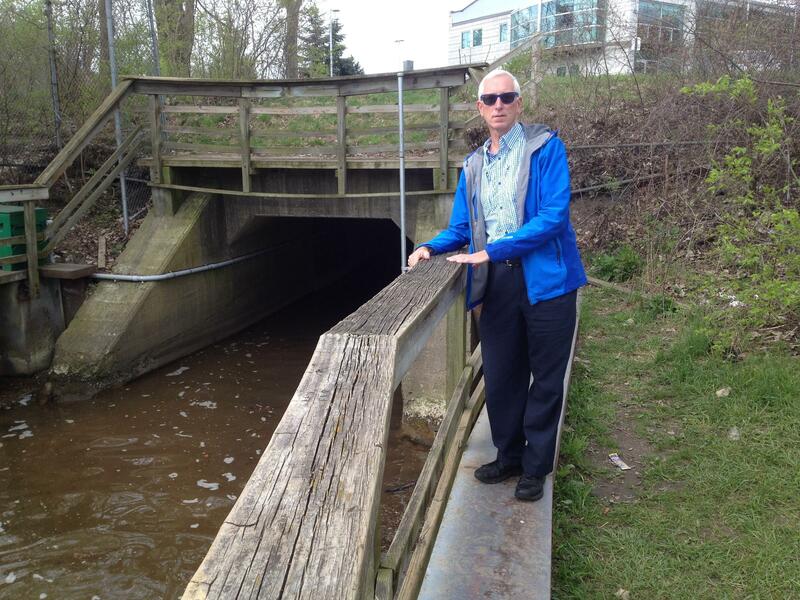 BL: I met with Dr. Lemke, by Argo Dam, to learn more about his findings. He says his modeling shows dioxane could already be reaching the Huron—from the Allen Creek drain, where we’re standing now. But he doesn’t advocate simply pumping and treating more, as there could be unintended consequences. Lemke: …such as lake levels dropping or stream flows dropping because these systems are all interconnected with the groundwater flow. BL: What about reinjecting the treated water? Lemke: I'm personally not a big fan of reinjecting the water back into the aquifer. 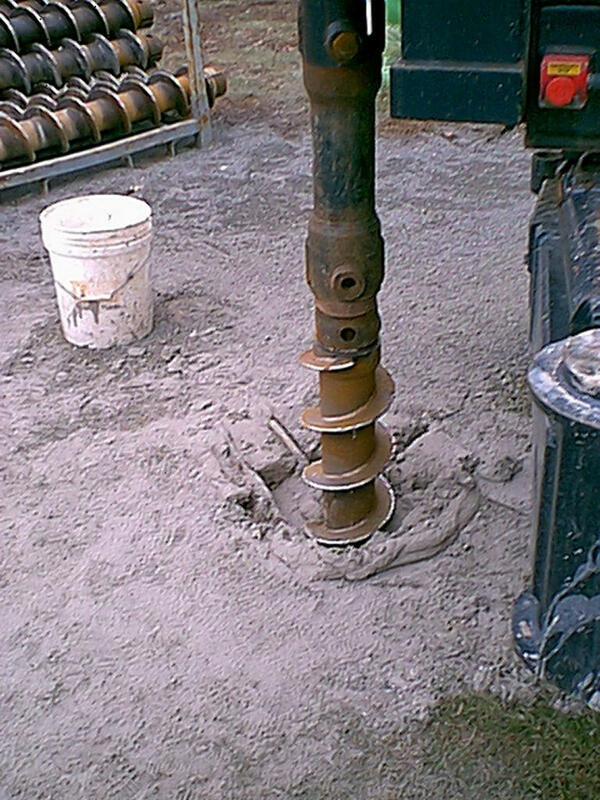 Lemke: …maybe build a small transmission pipeline that would transport that water back to the Huron River downstream of Barton Pond, where we get our water supply. BL: He says he’d like to see an opportunity to develop an effective strategy out of court. Lemke: You can get more done if you set the politics and the legal stuff aside. The conversations work better in my experience when you don't have lawyers in the room. BL: He’s frustrated the judge didn’t hear valuable information. Lemke: I'm really disappointed that we didn't have the opportunity to inform the decision-maker—the ultimate decision-maker on this—about some of the technical realities. BL: Back at the Town Hall meeting, Michigan Department of Environmental Quality Director Keith Creagh seems open to input. Keith Creagh: Now is the time to enter in on the numbers and the models if they aren’t right, we are in a community with a number of Phd’s, I bet. Dr. Rita Loch-Caruso: It’s expected that 1,4-Dioxane moves very efficiently from the mother’s blood into breast milk. BL: She has issues with the idea that 7.2 ppb of dioxane is safe for everyone to drink. Loch-Caruso: We need real action that protects the citizens’ heath. BL: Next Monday, the Attorney General will be attending the Technical Meeting of the Dioxane Remediation group. For folks who want the next steps to include scientific input from the city and county levels, that’s a step in the right direction. DF: The Green Room will continue to explore the issues and concerns related to the 1, 4 dioxane plume in the Ann Arbor area in the weeks and months to come. To listen to prior episodes of The Green Room, go here. Audio from the April 18th Town Hall Meeting provided courtesy of Michigan Radio.